A group of students, faculty, and staff gathered in PAC 002 on Thursday, April 30 to discuss climate change and divestment. The panel, titled “Inequality and the Climate Crisis: A Panel Discussion on Fossil Fuel Divestment,” was hosted by Wes, Divest! and the Committee for Investor Responsibility (CIR) and aimed to explain the moral and economic implications of divesting from fossil fuel companies. The four panelists were specifically chosen to represent different areas of expertise and points of view. The panelists included Onte Johnson, a community organizer with the Sierra Club’s Beyond Coal campaign in Bridgeport, Conn.; Beth Herz ’07, a board member for the Responsible Endowments Coalition; Professor of Economics Gilbert Skillman; and University Head of Operations and Investment Associate Brett Salafia. Wes, Divest! 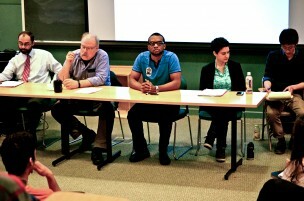 member Claire Marshall ’17 spoke to the necessity of having panelists from diverse backgrounds. CIR member Michelle Li ’16 added that different viewpoints were important to appeal to attendees from various parts of the University community. The event began with an opening statement from each panelist, and then opened up to a question and answer format. In her statement, Herz asserted that the divestment movement must focus on local and tangible goals. Not all of the panelists were as assertive about the ethos behind the divestment platform. Skillman raised several questions about the motivation behind divestment and the potential consequences. Skillman expressed concern that if the reason for divestment was to uphold an ethical principle, the University must divest from any industry that has similar moral issues, which could cut it off from many major industries and severely affect the endowment. Skillman raised the topic as a concern; Marshall found this to be a compelling pro-divestment argument. Marshall further acknowledged that any divestment would be an ongoing process, and she stated that the beginning of this process is the goal of Wes, Divest! Skillman’s second point led to further discussion about the effectiveness of divestment versus the potential for effecting change as shareholders. Herz spoke to this point, reiterating her support of divestment as the most effective approach in the fossil fuel industry. The panel aimed to raise difficult economic and ethical questions and to push attendees to think about the most responsible and effective course of action. Tess Altman ’17 said that the event made her consider divestment and the alternatives more complexly. Wes, Divest! and the CIR will be introducing a referendum to the administration and Board of Trustees in the fall of 2014. Although Marshall acknowledged that there is still much work to be done with the administration and the University Investment Office, she stated that the number of attendees at the panel was encouraging. Important to distinguish divestment from coal vs. all fossil fuels, as Stanford did. Coal is filthy and it is possible to move away from it and meet energy needs. Moving from all fossil fuels in near term is about as practical as returning to an agrarian lifestyle. Hope you set realistic targets and then drive towards them.